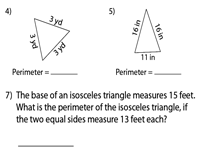 Navigate through our meticulously designed perimeter of a triangle worksheets for students of fourth, fifth and sixth grades, to develop skills like finding the perimeter of a triangle with dimensions represented as integers, decimals and fractions. 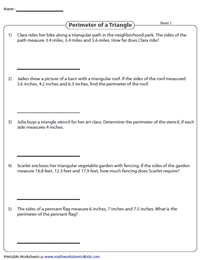 Determine the measure of the sides using the perimeter and solve word problems too. 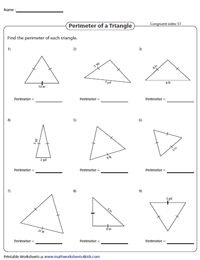 Utilize this assortment of worksheets focusing on finding the perimeter of a triangle whose dimensions are given as integers ≤ 20 in level 1 and ≥ 10 in Level 2, to provide ample practice to students of grade 4. Bolster practice in finding the perimeter of equilateral, isosceles and scalene triangles presented as geometric shapes and in word format. Add up the side lengths to compute the perimeter. 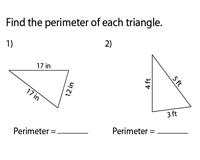 This compilation of fifth-grade worksheets features problems on finding the perimeter of triangles, whose dimensions are given as decimals. Work out the perimeter by adding up the side lengths. Calculate the perimeter by plugging in the given measures of the sides offered as fractional values in the formula P = a + b + c, where a, b, c are the three sides of the triangle. 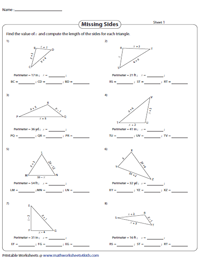 Figure out the perimeter of equilateral and isosceles triangles in this batch of worksheets. The measures and the congruent sides are indicated in each triangle, apply the congruence property to solve. Included here are scalene, equilateral and isosceles triangles with their congruent parts marked. 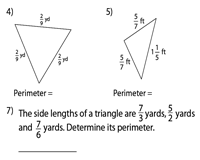 Rearrange the perimeter formula, substitute the known values and solve for the missing side of each triangle. The dimensions are presented as algebraic expressions. Add up the side lengths and equate with the given perimeter. Solve for 'x', plug its value in the expression to find the length of each side of the triangle. 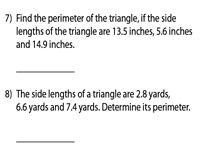 Read each real-life scenario carefully, highlight the measures, visualize the triangle and then determine its perimeter. 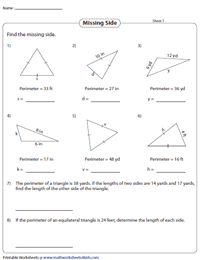 Reiterate the concept of finding the perimeter of triangles with this set of word problems worksheets.